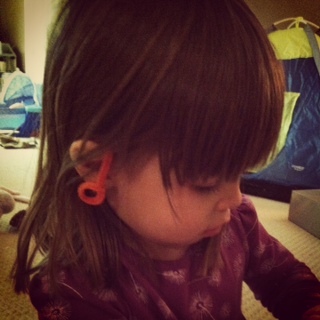 I’ve recently received a couple of “why aren’t my ears pierced?” questions from Sweet Girl. Not frequent enough for me to really think she wants to get her own pierced (yet), but enough to know she notices mine are and her’s aren’t. Enough to know it’s a thought circling around in her mind. Eventually she’s going to ask. Like really ask to have her ears pierced. I don’t mind this. DH however does. What is it with men and their daughters’ ears? Maybe it’s just the men I know. When you don’t have real earrings, you fake it with pipe cleaner earrings. I was four or five years old when I got mine done. I remember asking a long time too. My mom hesitated because my step-dad (my sister’s dad) didn’t want it done. But I think I was driving my mom crazy with the constant asking so she just went ahead and did it. Boy was my step-dad furious. I was so happy to have pierced ears. I remember my earrings were green-stone studs. I loved them. Oh and when I could finally swap them out for “fashion earrings”…talk about ecstatic. I remember receiving a pair of ladybug earrings for Christmas (when I was six-years-old I think?) and I thought they were the bomb. Fast-forward to me at 11 years-of-age and dying, just dying to get my ears pierced again (double-pierced — so cool). My mom said no for what felt like forever. My now step-dad (my mom remarried when I was 11) was against it. Like super against it. I guess I badgered my mom enough (again) that she capitulated and boom! I had double-pierced ears. Fast-forward again and I’m now 14. My friend and I wanted to get one ear (our left) triple-pierced. So we went and did it. I was able to hide it from my dad for a while because I had super long hair back then. Oh but the one day I tucked my hair back behind my left ear in front of him…ooh was I in trouble. My dad saw it as me permanently scarring myself, but I didn’t — and still don’t — see it that way. When I was in my twenties I took my “extra” piercings out. I just grew tired of the double- and triple-pierced ear-fashion I guess. But at 21-years-old, I got a helix piercing on my left ear. A simply silver hoop. Nothing too ostentatious. I think it was the trendy thing to do in the 90’s because a lot of women (and men) my age got it done. Anyway, it doesn’t bother me at all that Sweet Girl wants her ears pierced. I know parents who had their daughters’ ears pierced when those girls were infants. I see the smartness of this — the pain is nominal and before you (or the baby) knows it, her ears are pierced. Different when you’re older and have a deeper memory bank of pain. Although when I was four-/five-years-old getting my ears pierced, I remember it hurting. But then it was over. I only had time to take in a breath to scream but then…bam. It was done and didn’t hurt anymore. Anyway, DH’s argument is that he would rather wait until Sweet Girl asks to have her ears pierced. In other words, asks and asks to the point we know she really means it. I get DH’s view point. Her body, her choice. I think that day is fast approaching. How about you? Are your ears pierced? How old were you when you got it done? If you have daughters…same questions. My feeling is that until they are able to 1) pay for the piercing with money they’ve earned or saved and 2) they are old enough to be responsible for their bodies and the cleaning that is required they will have to wait. My sister had her ears done at 10, but had a reaction to some earrings she bought, had a massive infection and still has a large scar across her earlobe. I also had reactions to anything not gold and my ears became really infected when I had them pierced a second time, I had all sorts of issues until I knew what the problem was. I’ve had my nose pierced twice too so I’m not against piercing, I just think there are some things that we should wait for. Emma, I like the point you make about being able to pay for it themselves AND be old enough to care for the cleaning, etc. The responsibility required ensures they’re committed to the decision – at least one hopes so anyway. Neirin must really like the stripes on your tarmac to want his hair dyed the same. Too funny. I never realized what an issue this is until I had a girl myself! After much thought, I got P’s done when she was a baby. Since almost all women in our society have their ears pierced, i decided just to get it done when she was little enough to leave them alone. I went to a good place and got decent real gold earnings and four years later she still has them in. I totally get the argument that it’s her body and it should be her choice, however so many little kids are asking to get their ears pierced and I have to wonder at 4 or 6 or even 10 is it really their choice? They wouldn’t be choosing it if they weren’t being told it’s pretty, etc. They’re not making that choice in vacuum KWIM? So if ‘we’ think pierced ears are nice and desirable, at some point she is going to want it done. Just seemed easier to get it done sooner rather than later. Second piercings and other body piercings can be done at her own expense when she’s old enough to earn the money herself and take care of them properly. Maranda – Yes, people have really strong feelings about it, but ya, it is considered an “adornment norm” in our society. Your comment about the choice not being made in a vacuum is a good one; I know this bc Sweet Girl isn’t asking to get her ears pierced…she’s asking why her ears aren’t pierced too (like mine specifically, but I’m sure she also means her Nanny, her grandmother and some of her playmates). Interesting to see how long it takes before this becomes a more serious request from her. And then how long we’ll wait after the fact. I had my ears pierced as a teen – took them out due to metal allergies. I’ve had them done a few times since then but finally just let them grow shut in college. I feel awkward in earrings. I think I’ll have my daughter wait till 12 if she wants to get them done at some point. Kate, I have a few friends who have done the same — either because of a bad experience with the metals used in earrings (allergic reaction like you had), delays in healing or they discovered wearing earrings just wasn’t something they liked. Thanks for commenting! Well, I was 12 it was a big deal because my mom had not had her ears pierced and she could not believe that I wanted them done. I used my own money. Fast forward. My mom eventually had hers done when she was in her fiftys! Why? Because she kept losing her earrings. Oh and Mel, if and when Sweet Girl gets them done…I can do them. I have the machine and the earrings. Most infection occur because the ears are touched with dirty hands. One of the reasons many do not pierce toddlers or young children. The pain isn’t too bad but the loud ‘POP’ of the gun startles the younger ones and then they begin to cry etc. I’ve done many. All turned out well.Just saying. Oh and I have to add: guys don’t get it. They can grow beards and moustaches etc. that is a guy thing which some women don’t like…but piercing their little girls ears…I think men believe that their little girl is growing up and that scares them. Wait till she starts asking for a tattoo! Or having her belly pierced. Yeah, piercing ears easy one. I had both of my girls ear’s peirced when they were babies, honestly it was because they were both bald and even dressed in a pink dress I would get strangers making comments on my handsome boys! Seriously, Mel you have seen my girls since they day they were born…they have always looked like girls! I kept the “studs” that they were peirced in for many years, never changed them, just cleaned them. When M hit 7 years old she told me she no longer wanted them, so I told her it was her decision and that if she decided when she was older that she wanted them peirced again, it would be coming out of her pocket. She agreed and took them out 4 years ago and hasn’t made a peep about it. R on the otherhand, wanted to wear fashion earrings, so I bought some and after a little while her ears got really infected. So I bought her little (and I mean little) diamond studs in real gold that she wears everyday and is not allowed to take them out. I told her that when she is old enough to care for and pay for other ones, then she may do so. I never had the conversation with my husband about it, I just came home with the girls ears peirced. But I, like you Mel had a double peircing on one ear and a triple peircing on the other when I was a teenager (Dad hated it tremendously…but hey I turned out ok!) I too took out my “extra” peircings when I graduated from college. I live in Italy. The vast majority of italian women has pierced ears. It’s an old tradition in my country: italian girls used to have their ears done a long time before ear piercing became a fashion statement in the States. Depending on family tradition girls’ ears could either be pierced at birth or as a First Communion present (you know our deep Roman Catholic legacy…). Until piercing guns spread among the italian jewelers and beauty salons in the late ’70s, ears were often pierced at home by an “expert” woman of the family using a sewing needle and silk thread. A cork was placed in the back of the lobe. I remember my granny (my father’s mom) talking about her ears pierced for her First Communion by an old aunt and the excruciating pain she had to suffered for the sake of beauty: inserting the very first gold earring through the newly pierced hole hurted even more than the needle did! However my granny always told me she felt so proud of her earrings, and she always loved to wear them. Sometimes she tried to foster me to have my ears done (gunned, of course! ), but I didn’t cave in to her pressure, nor to the pressure of my multi-pierced peers. In fact, though it’s quite uncommon for an italian woman, my ears are still unpierced. I have “virgin” earlobes. And my mom’s ears are unpierced as well! She wears clip-ons on a quite regular basis. I tried them sometimes in my teens but can’t stand them: clips start hurting your earlobes after just a few hours and I even suffered headache while wearing them. Plus, clip-on earrings are just far from being as cute as the pierced ones. So I did without earrings all life long. 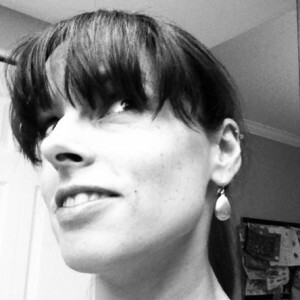 I had long hair, so I didn’t care so much, I always thought earrings were not “my thing”. Even though I like to see them worn by other girls and women, and sometimes I even gave earrings as a present to my pierced friends! That said, I’m now contemplating to have my earlobes done. At 34! My 7yo daughter started asking for pierced ears when she noticed blings on the little lobes of some kindergarten mates. Since I didn’t think she could be mature enough to responsibly make such decision about her own body and to take care of newly pierced earlobes properly, I didn’t say “NO!” (I see nothing bad in pierced ears, after all it’s cute) but I delayed the deed as much as I could. Now my DD is almost 7, she’s a responsible an mature girl for her age and… she’s still asking for pierced ears. She’s convinced and convincing. It seems to me that getting her ear pierced for her 7th birthday could be a wonderful present, something to remember all life long. And my DH suggested me to go with her: having our ears pierced together would be a nice bonding experience, a lovely mother-daughter thing. And I agree… so I’m now going to have my ears pierced for the very first time, together with my daughter. I’m quite excited, and even more is my DD! I’m still trying to convince my mother to come with us and have hers pierced as well… at 61! Wouldn’t it be super-nice? My mom told my sister she had to wait until she was 8, but I begged and pleaded enough that I got mine done when I was 7 (I think the only reason I remember is because I won that argument). I think I’ll tell my daughter the same, she waits until she’s in Grade 1 – and I will take her to a proper piercing place rather than a mall kiosk.